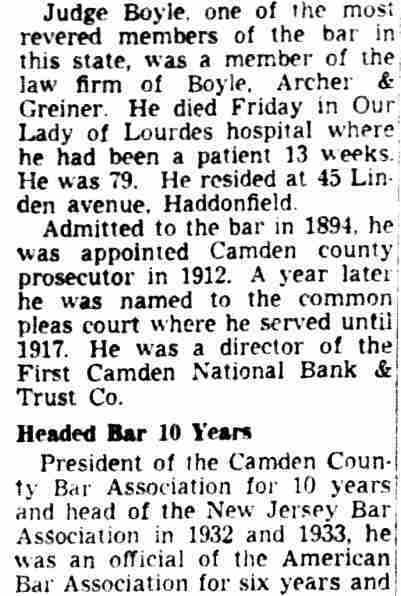 Camden People - Frank M. Travaline Jr.
FRANK MICHAEL TRAVALINE JR. was born July 19, 1899, the son of Frank and Antoinette Travaline. 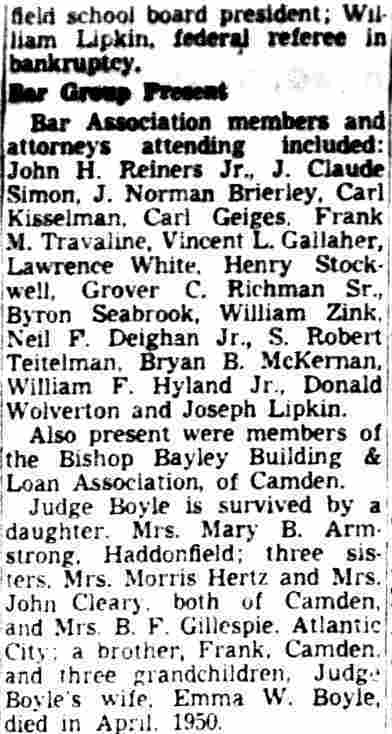 The Travaline family lived at 1117 South 4th Street in South Camden, between Chestnut and Sycamore Streets. 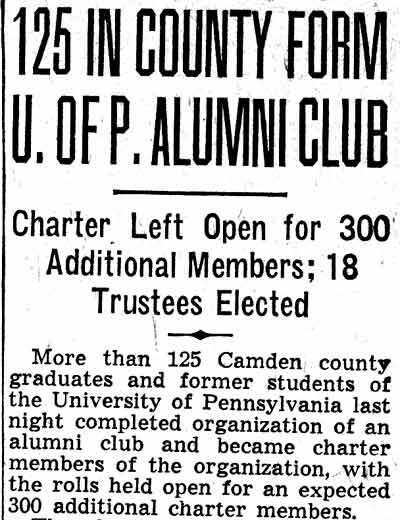 A 1919 graduate of Camden High School, where he was a student of Lucy Dean Wilson, Frank Travaline Jr. went to college, and then studied law, graduating in 1926 from the University of Pennsylvania Law School. 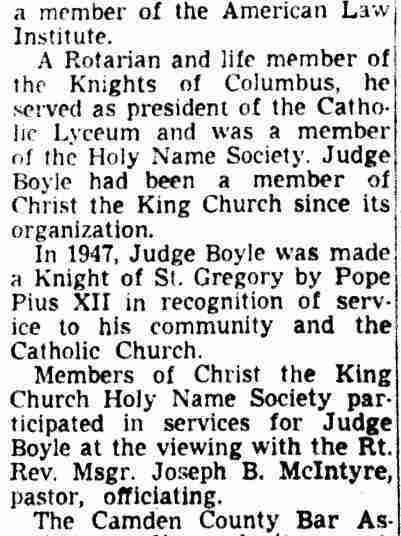 He was practicing law in Camden and living with his parents, brother Dominic, and sister Nan at the time of the 1930 census at 1117 South 4th Street. 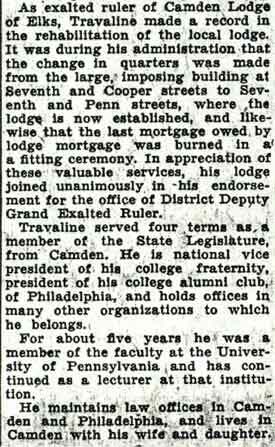 Frank Travaline practiced in Camden and Philadelphia for many years. 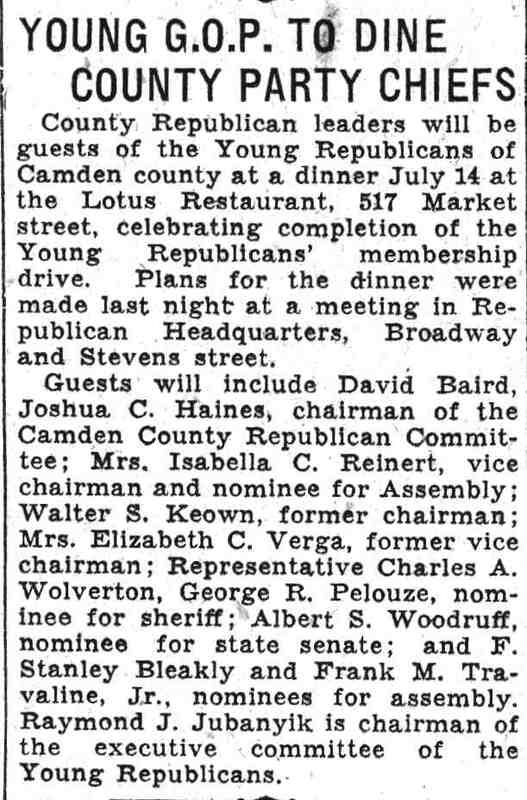 He was a four-term New Jersey State Assemblyman in the 1930s, and ran for the office of Camden County Surrogate in 1934. 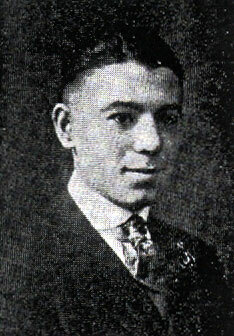 An accomplished musician, Frank M. Travaline Jr. played trumpet with the Winegar Orchestra in New York, the Howard Lanin Orchestra and the Meyer Davis Orchestra. Another young musician who appeared with Howard Lanin was violinist Louis Feinberg, better known as Larry Fine of the Three Stooges. Hi brother, Dominic "Don" Travaline, was a professional musician, songwriter, and composer. 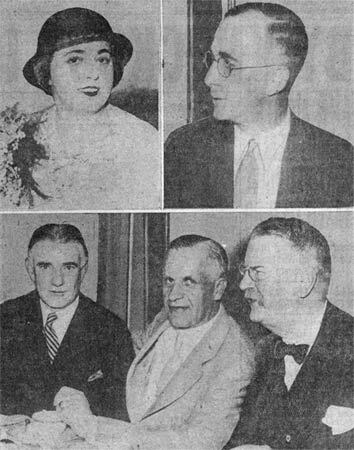 Frank M. Travaline Jr. married Winifred S. McHugh, and the Travaline family eventually included several children. 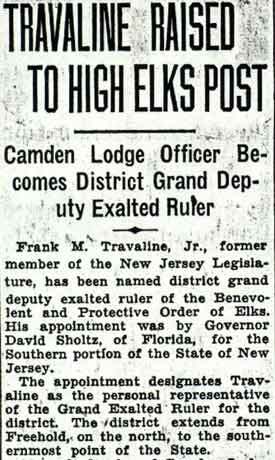 He was an active member of the Elks, served as Exalted Ruler of the Camden Lodge, and in higher posts in the Elks organization. 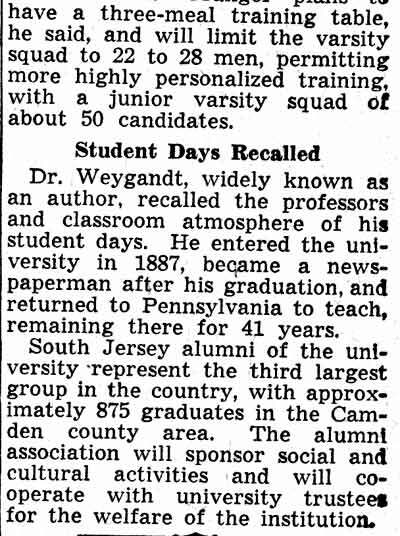 He also taught at the University of Pennsylvania for five years. 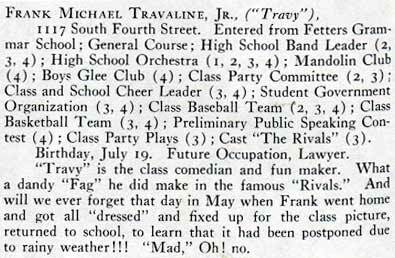 Frank M. Travaline Jr. last lived in Woodbury Heights NJ. 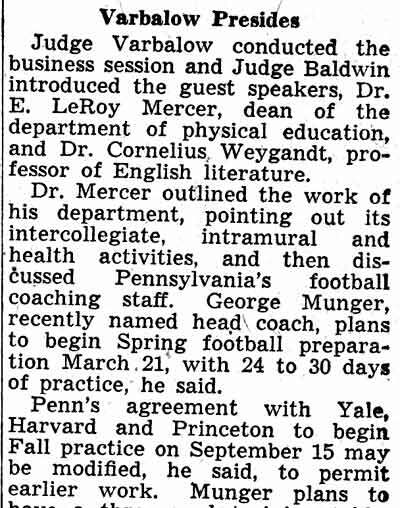 He passed away December 15, 1999 at the age of 100. 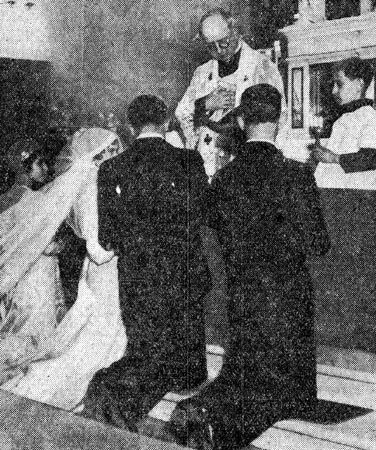 He was survived five children, Sr. Patricia A. Travaline, MMS, Philip F. Travaline, Richard J. Travaline, Mary Ellen Krucz & Frank M. Travaline III; 10 grandchildren and 5 great-grandchildren. 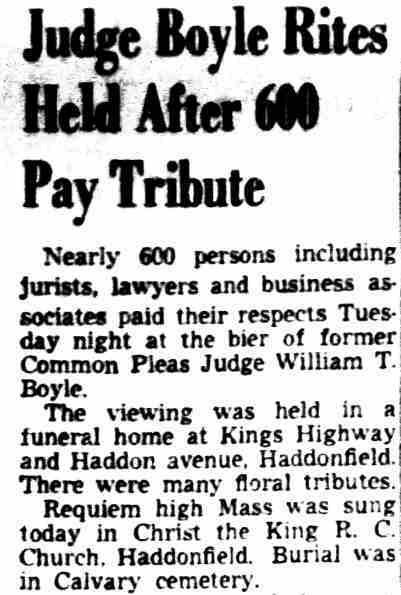 Frank M. Traveline Jr. was buried at Lakeview Memorial Park, Cinnaminson, NJ. 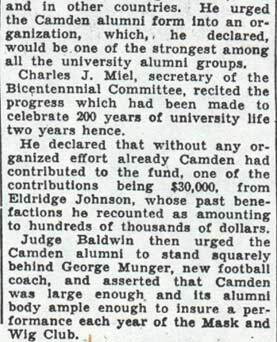 from Camden High school in 1928. Montana is 26 and a contender for the world's heavy-weight wrestling diadem. Following a wedding tour through the West the couple plan to reside in Camden. 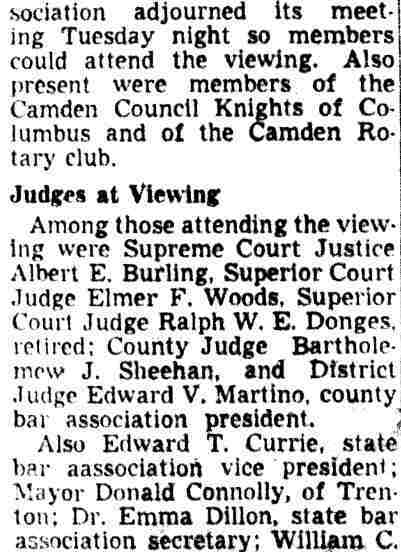 Trenton, June 5.-An open break between David Baird, Jr., and Senate President Emerson L. Richards, of Atlantic, was revealed tonight. Richards issued a statement attacking Baird and Assemblyman Frank M. Travaline Jr., of Camden as an aftermath to a fight in the Senate corridor last Thursday afternoon. Travaline alleges he was assaulted by B. George Ulizio, of Pine Valley, former Atlantic City real estate man, and close friend of Richards. Earlier tonight, an Assembly committee was appointed to investigate the attack at Travaline's request. Ulizio has denied any knowledge of the attack but he was identified by several witnesses and by Richards himself in his statement. 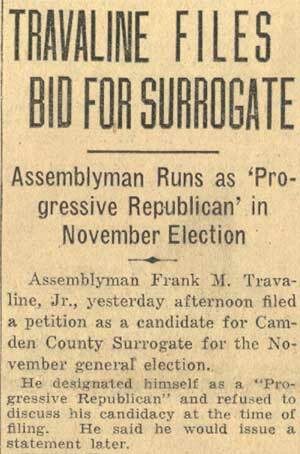 “Assemblyman Travaline has made a nuisance of himself all during the session. I did not know it was he that was interrupting my speech last Thursday. After I was interrupted twice, he then left. 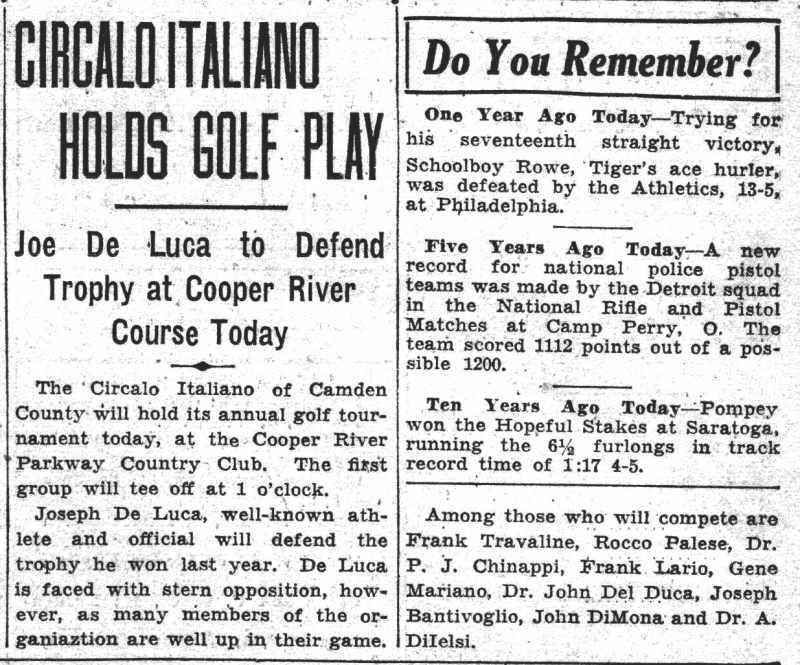 "He got out by the door and turned around and Ulizio heard him address an insulting remark to me which of course I did not hear because the door was closed. He and Ulizio got into an altercation which wound up in the outside corridor. Ulizio does not represent me in any way. "Unquestionably Travaline was put up to making this attack by Baird, who was in the state house this afternoon. Apparently some of the Assemblymen, including Travaline, won't work and won't let the Senate work. 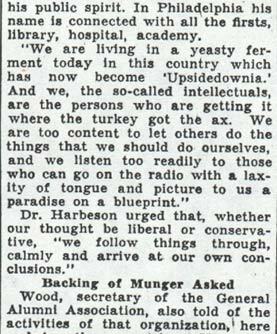 They haven't added a single constructive thought this session." Arising on a question of personal privilege, Travaline brought the matter before the Assembly, declaring that he was assaulted "without provocation in the Senate chamber by B. George Ulizio, who ran for cover into the private office of the Senate President and hid behind the skirts of a woman." When Travaline urged that the Assembly act, Assemblyman Herbert J. Pascoe, of Union, made a motion that a committee be appointed to call on Ulizio for a public apology. Assemblyman Theron McCampbell, of Monmouth, moved to amend the motion to provide that the committee first investigate the case and then report back to the Assembly. His amendment was defeated. 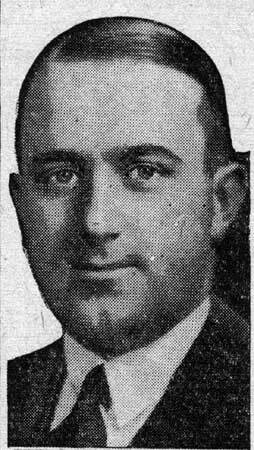 Assemblyman Joseph Altman, of Atlantic, majority leader, questioned the procedure and whether the Assembly had the right to demand such an apology. Then Assemblyman Clarence A. Ward, of Union, proposed an amendment that the committee confer with Senate President Richards. Assemblyman Anthony J. Siracusa, also of Atlantic, objected to this and Minority leader John J. Rafferty, of Middlesex, suggested that it be determined definitely by the Assembly just what occurred "in the corridor" before calling on the Senate President. "This took place behind the reporters' desk in the Senate chamber," Travaline corrected. 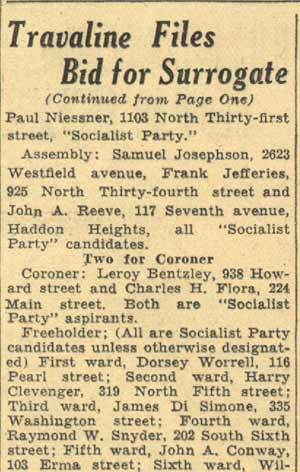 He was corroborated by Assemblyman Eugene W. Hejke, of Hudson. 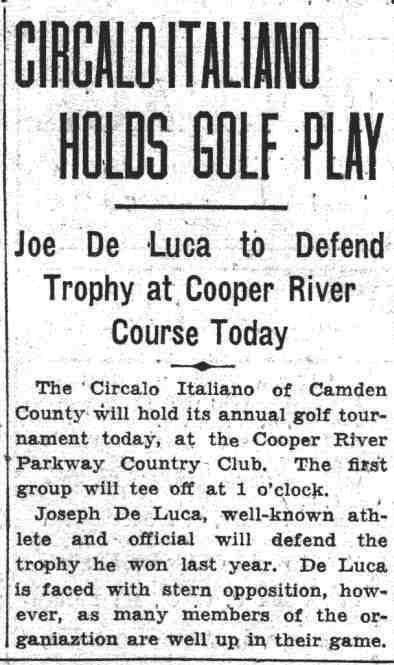 Travaline then suggested that Ulizio could be arrested by the Assembly or be barred from the State House. "Rather than see this whitewashed, I'd prefer to drop the whole matter and take care of it myself." After more discussion Speaker Charles A. Otto named Majority Leader Altman, Minority Leader Rafferty and himself to confer with Senate President Richards, Senate majority Leader Clifford R. Powell, of Burlington, and Senate Minority Leader Blase Cole on the case. Travaline charges that Ulizio struck him, forcing him to fall when he tripped over his topcoat, during an argument during last Thursday's Senate session. Ulizio, though admitting he was in the State House at the time, has denied any knowledge of the attack. .
Assemblyman Frank M. Travaline Jr., of Camden, last night denied a charge by Senate President Emerson L. Richards that his remarks in the Assembly Monday night were dictated by David Baird, Jr. In a statement last night, Travaline Jr. charged the Atlantic county senator was making a "wild dash to ensnare the Republican organization nomination for governor of New Jersey" and forgot "details and personal feelings of individuals." 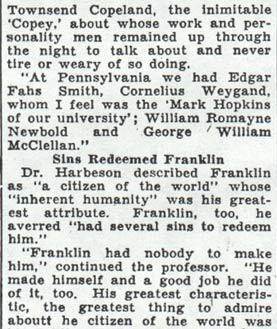 "Senator Richards, in his usual precipitous manner, according to authoritative reports, takes it upon himself to charge the members of the Assembly with being disinclined to work, and as not having had one constructive thought to date. To people who observe and appreciate conditions in the Legislature, it needs no stretch of the Imagination to discern that the work of all of the members of the Legislature, all of whom are conscientious ladies and gentlemen, is being impeded by the personal ambitions of the president of the Senate, who unquestionably is in a position of control and author­ity in the Senate. 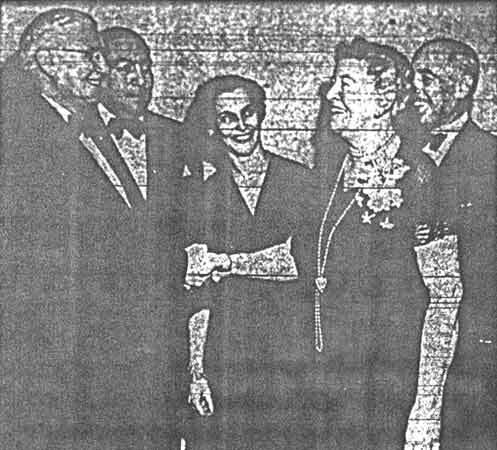 I am personally satisfied that every member of the Assembly, as well as every member of the Senate, has tried conscientiously to perform her or his duty up to date and are not disinclined to work and are not interfering with the program of Senator Richards, expect where the best interests of the people of this State are sacrificed for the blind ambition of Senator Richards to be his party's choice for governor. Senator Richards goes to great length to accuse me of being and having been a nuisance during the session by going in the Senate chamber and talking loudly. If this were true, Senator Richards is the presiding officer of the Senate and he has never to date made any com­plaint or even said as much as a word to me, indicating that my presence was not desired in the Senate. 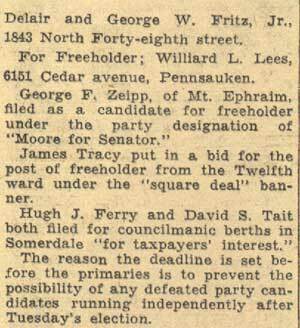 "The whole situation, as far as Senator Richards is concerned, in my personal, opinion, is that he apparently forgets details and the personal feelings of individuals in his wild dash to ensnare the party's nomination for governor. It has been stated publicly on the floor of the House of Assembly that he has on more than one occasion insulted members of the Assembly. 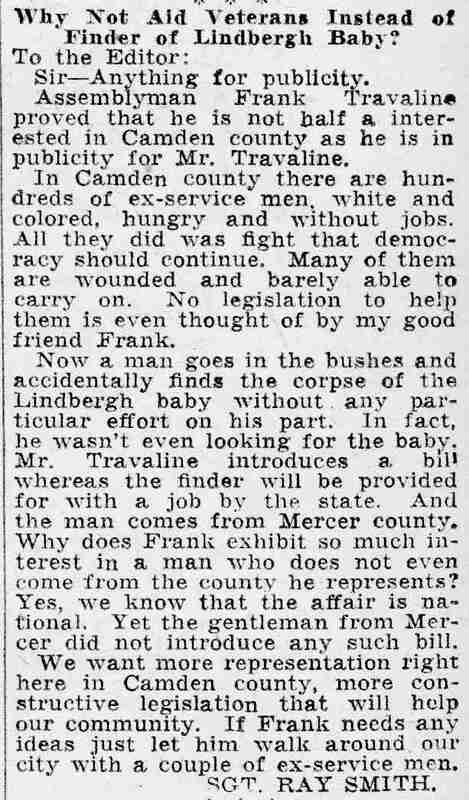 "Specifically he insulted and later had to apologize to Assemblyman Chamberlain of Mercer county for having had him expelled from the senate floor, yet no one has dared to say that Assemblyman Chamberlain is not a gentleman. In addition, not more than a month ago, the personal aide and representative of Assemblyman Muir was sent to the Senate chamber on official business by Assemblyman Muir. He was expelled by direction and order of the Senate president for which incident Senator Richards received a stinging rebuke publicly on the floor of the Assembly. 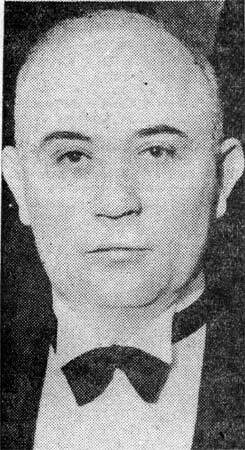 Assemblyman Muir, threatened physically to eject Senator Richards if he ever dared again to visit the House of Assembly without permission. Furthermore, I have been advised that the clerk of the House of Assembly, Robert Purdy, a former member of the House, was in the Senate on official business and was ordered ejected by the Senate president, all of which was uncalled for. This is a course of conduct that denotes either that the world is wrong and Senator Richards is right, or that Senator Richards is wrong and the world is right." 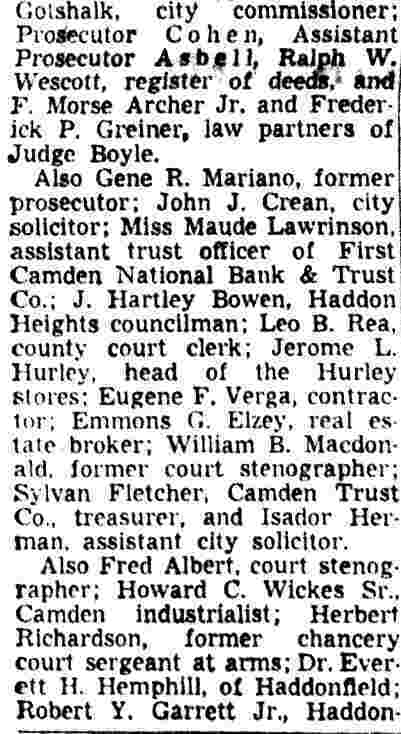 That pest (the one who used to claim he was Commander John D. Pennington's bodyguard) now says he has been selected as deputy U. S. marshal for this district to fill the vacancy caused by Paul McLaughlin's resignation ... By the bye, what former federal employee runs a whisper-low in Philadelphia and did so even when he worked for the government? .. It is, however, a respectable, or as respectable as speaks can be. Why, every time it rains, is the rondpoint at the airport flooded? That young local attorney accused of tipping off some prisoners that a news cameraman was going to photograph them and who also is alleged to have threatened to break the camera denies it all ... He says it was a cop who did all that. .. So that's that. .
Trenton, June 22 (Thursday)­ The Senate early today approved Senator Joseph G. Wolber's jury reform bill providing for appointment of jury commissioners by Supreme Court Justices. Senate President Emerson L. Richards, of Atlantic, failed to muster enough votes to pass the amendment to the state constitution to permit lotteries, a companion to the horse racing bill approved Monday night. 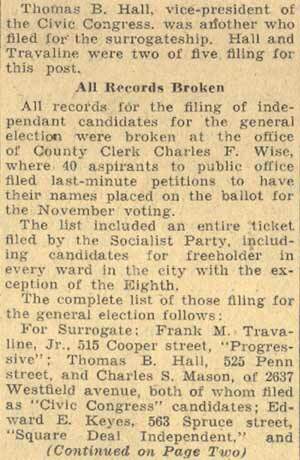 He laid it over when he could obtain only four votes in its favor. The Assembly killed the Civil Service "ripper" bill affecting the State Highway Department, which was passed by the Senate Monday night. The vote was 22 for and 34 against. 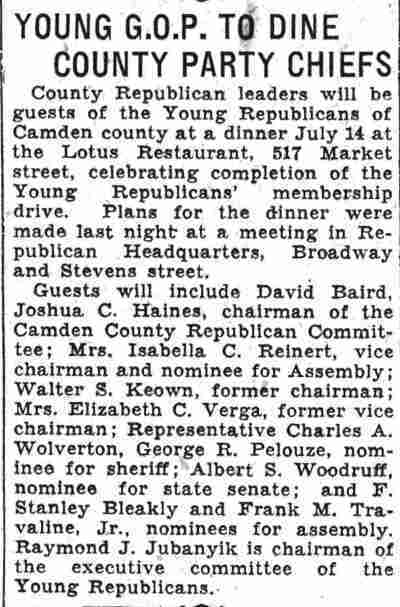 Senator David Young, of Morris, and Mayor Frank Dorsay, of Perth Amboy, were nominated and immediately confirmed to succeed Firman M. Reeves and Abraham Jelin on the State Highway Commission when their resignations become effective September 1. The key bill of the Princeton survey fiscal reform measures was adopted by the Assembly and is ready for Governor Moore's signature. Sponsored by Senator Dryden Kusel, of Somerset, it will make the governor virtual czar over state spending by provision for a state finance commissioner who will be directly responsible only to the governor. The vote was 40 to 10. A snag was reached, however, on one of the other fiscal bills. Four were passed by the Assembly Monday night as adopted by the Senate two weeks ago, but a fifth, creating a new budgeting system, was amended in the Assembly to remove legis lative control of funds of professional boards. The Senate by a vote of 5 to 9, refused to concur in the amendment. Senate and Assembly leaders were in conference in an effort to reach an agreement. A minor Assembly amendment in Kuser's bill was approved by the Senate. It eliminated the provision that the state finance commissioner should act as secretary of the state sinking fund commission. 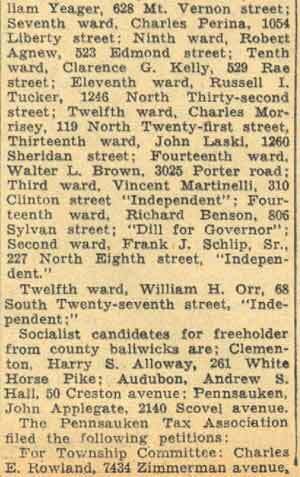 Assemblyman F. Stanley Bleakly, of Camden, aided by Assemblyman Marcus W. Newcomb, of Burlington, led the unsuccessful opposition to the Kuser bill. 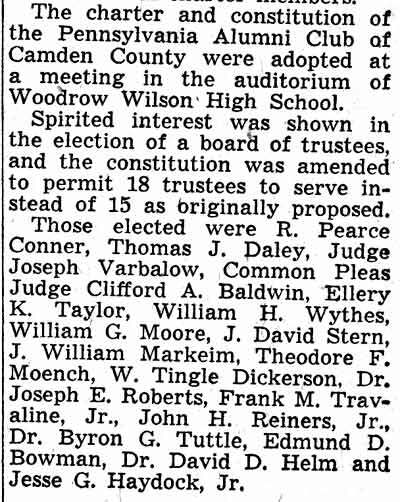 Assemblywoman Isobella C. Reinert and Assemblyman Frank M. Travaline, Jr., the other Camden members, joined Bleakly in voting against the bill. Assemblyman Joseph Altman, of Atlantic, handled the bill on the floor and engaged in a lively verbal tilt with Bleakly. "The bill does not honestly carry out the Princeton Survey recommendations but merely adds another group of jobs, Including that of the finance commissioner at $10,000 a year, to the state government," said Bleakly. 1. The creation of a department of fiscal control, consisting of a division of purchasing, accounting and budgeting. 2. Transfer of certain functions of the state house commission to the commissioner of fiscal control, who shall be the direct agent of the governor." "This is part of the general scheme or deals which has marked this session of the Legislature," Bleakly continued. "We have plenty of machinery now to check on the state's finances and expenditures. There is the budget department, the purchasing department and the civil service department on salaries. This only adds another unnecessary department with about $30,000 in salaries." In reply Altman said the bill was an economy measure, that it did follow the Princeton Survey recommendations and that no politics were involved. 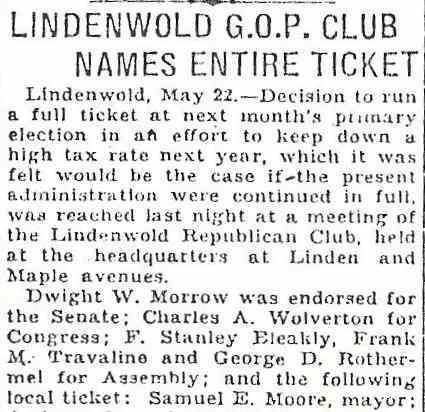 In addition to the Camden members and Newcomb, Gurk, of Gloucester; King, of Morris; Kinzley, of Bergen; Mutchler, of Morris; Platts, of Essex, and Willis, of Ocean, all Republicans, voted in the negative. "She was the most valuable public servant we ever had. 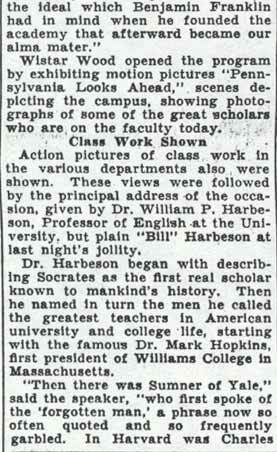 She was a good disciplinarian and had a broad view of education. She tried to understand the problems of the pupils, parents and board of education. The high standard of the Camden school system and its high rating are attributable to her efforts. Camden has suffered a distinct loss." 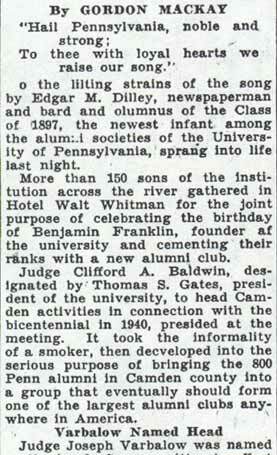 Charter members, who 40 years ago, aided in the organization of the lodge, are Frank A. 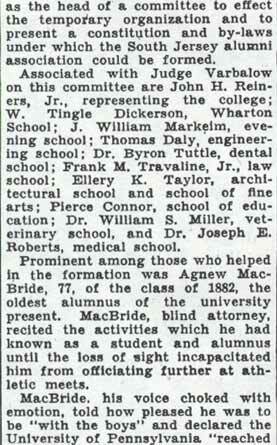 Ward, Charles L. Bowman, Dr. A. H. Lippincott, Dr. J. F. Leavitt, Fred W. George, T. L. Bear, William M. Fithian, Everett Ackley, Fithian S. Simmons, Philip Wilson, Paul E. Quinn, John N. Kadel, William G. Maguire and Maurice Hertz.